If your idea of the perfect travel destination includes sunny beaches and interesting attractions, you should visit Las Palmas. Located in the Canary Islands off the northwestern coast of Africa, this Spanish city has been favored for centuries as a popular tourist spot by many notable people such as royalty figures, famous explorers and modern-day celebrities. Come see the beauty, history and culture of Las Palmas, and you may never want to leave. The city’s four gorgeous beaches are the main reason many tourists travel to Las Palmas. 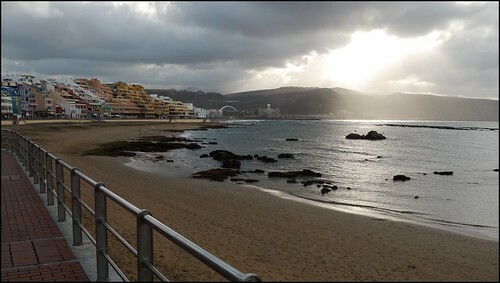 The largest and most popular beach is Las Canteras Beach. Featuring beautiful sands, calm waters and a barrier reef, this beach is perfect for swimming and snorkeling. You will also find a wide range of nearby shops, restaurants and hotel accommodation here. Located near sand dunes and mountains, Las Alcaravaneras Beach is where you can enjoy a number of fun activities like cycling, sailing, canoeing, soccer and volleyball. If you enjoy riding waves or watching surfing competitions, you will want to check out La Laja and Confital as they rank among Europe’s best surfing beaches. Whatever you do on Las Palmas, be sure to make time for a visit to Casa de Colon. Formerly the Governor’s House, this beautiful structure is now more famously known as the Columbus House because it was visited by Christopher Columbus during his first trip to the Americas in 1492. As the house is now a museum, you can tour 13 exhibitions here to see items collected from voyages of Columbus such as maps, navigational instruments and scale models. Additionally, there is an art gallery where you can view exquisite paintings from the 16th century and art works deriving from many indigenous cultures of Mexico and South America. Another site well worth a visit is the Cathedral of Santa Ana. You can tour this 15th century church to see its diverse architecture and 13 chapels that house stunning art works. A must-do in Las Palmas is a stroll through Triana, the city’s historic district. Here, you can walk along the picturesque streets and admire colorful, old buildings that contain charming boutiques and cafes. During August and September, the shops here feature a huge annual sale, called “rebajas,” where you are sure to find a great bargain. Las Palmas offers a variety of options for arts and culture. The Atlantic Center of Modern Art showcases a wide collection of visual arts while the Canarian Museum offers exhibits focused on the archaeology, history and culture of the Canary Islands. For live performances, the city offers several theaters, including the esteemed Alfredo Kraus Auditorium where you can enjoy symphony orchestra concerts. Other choice venues include the Perez Galdos Theater and the Cuyas Theater. Additionally, Las Palmas hosts several cultural festivals each year centered around heritage, music, film, dance and theater. If you want to check out the nightlife in Las Palmas, the historic district of Vegueta offers several bars, discos and nightclubs. What’s more, the scenic area surrounding the Santa Catalina Park also presents some hangouts that are popular among locals and tourists. The climate of Las Palmas is regarded by many as one of the world’s best, which is why the city makes such an ideal travel destination. No matter what season you visit, you will find sunny skies and warm temperatures. If you can’t wait to visit Las Palmas, you can begin your trip right now by booking one of the fabulous hotel deals that are available at HotelDealSite.com today.